Organics Studio Cysteine Brown Ink is part of the new Ammino Acid shimmer series from Organics Studio. Created by Tyler Thompson and handmade in Maryland, Organics Studio inks are unique in color as well as the names. Many of the inks are historically inspired by the great Masters of Science and Writing. Tyler has created some of the biggest mega sheening inks on the market today such as Walden Pond Blue and Nitrogen Royal Blue. Otherwise known as “shimmering” ink, the new Amino Acid series of inks contain micro-particles within the ink which produce an array of shine. Organics Studio Cysteine Brown ink is one of the new shimmering inks created by Tyler Thompson. Taking its name from the non-essential amino acid Cysteine, which helps with our body’s metabolic functions, Organics Studio Cysteine Brown ink is a beautiful light brown ink that shines with a golden shimmer. Continuing reading for a chance to win the bottle of Organics Studio Cysteine Brown Ink we used for this review. We used Rhodia dot pad paper with a glass dip pen made by J. Herbin for our review of Organics Studio Cysteine Brown ink. The dip pen has a tip equivalent to a medium-fine fountain pen nib. Organics Studio Cysteine Brown ink comes in the standard Organics Studio 55 ml. plastic bottle with its simple, yet functional cardboard outer box. Each box contains a label with details about the ink color and the element formula that creates Cysteine. Organics Studio Cysteine Brown ink retails for $16.00, but we currently have it available at a discount. Organics Studio inks are considered a low-mid range priced ink brand and affordable for handcrafted American made ink. 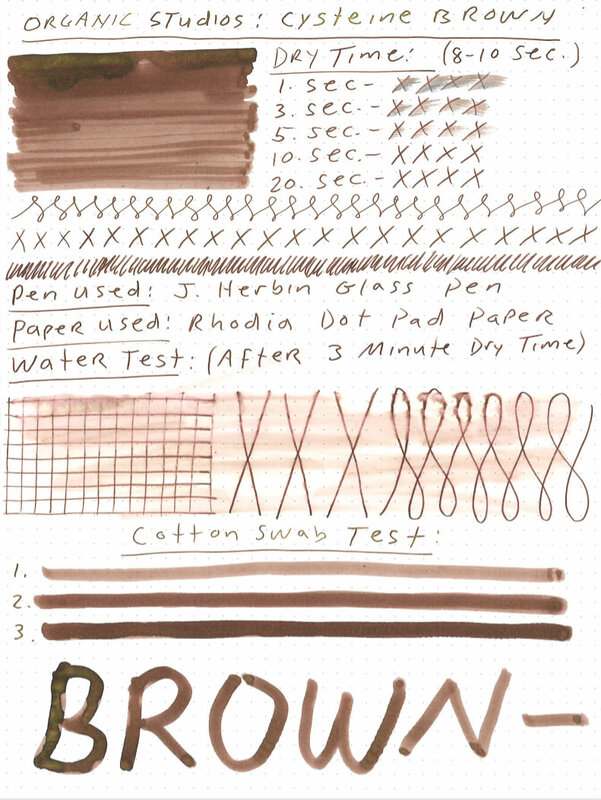 We found zero bleeding during our review of Organics Studio Cysteine Brown ink during normal use and during our cotton swab and water tests while using Rhodia paper. During normal use, we found no feathering during our review of Organics Studio Cysteine Brown ink. However, during our water test, one of the results was some slight feathering at the wettest points of the test. During our review of Organics Studio Cysteine Brown ink, we conducted a water test where we ran a wet cotton swab over a dried ink sample. The results were some light color smearing and slight feathering at the wettest points. For the most part, the lines remained clear and legible. Organics Studio Cysteine Brown ink is not waterproof ink but held up reasonably well. Organics Studio Cysteine Brown ink will produce some slight shading depending on the nib and handwriting style. What Organics Studio Cysteine Brown ink does produce is lots of wonderful gold shimmer. Assuming you have mixed the ink properly before use, the golden shimmer color is produced very simply during normal use. 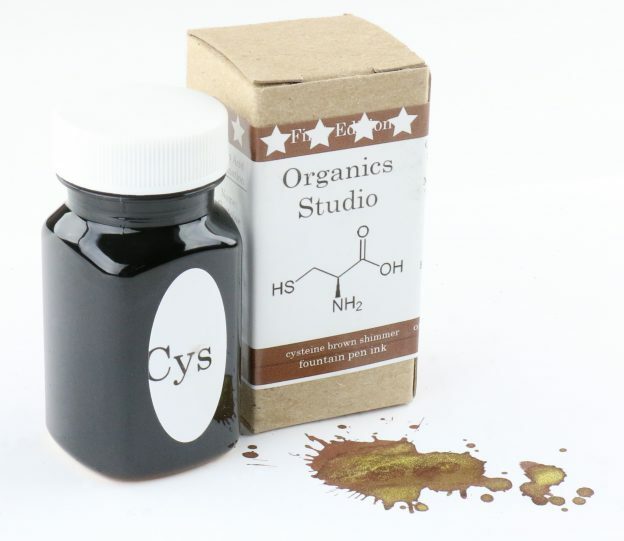 Organics Studio Cysteine Brown ink is a very nice brown colored ink that is perfect for art projects, letters, journals, invitations, and other similar uses. The gold shimmer in this light brown ink pops when used properly. The price is very sensible for handcrafted American made ink and dry time very reasonable. We are a big supporter of Organics Studio inks and Tyler’s creations, including his Amino Acid shimmer inks. As with other medium to high saturation inks or high sheening and shimmering inks such as Organics Studio Cysteine Brown ink, we recommend periodically cleaning your fountain pen (every couple of weeks) for optimal pen hygiene using a pen solution such as Pen Chalet’s pen flush. Happy writing from the State of Maryland! Ink looks sort of light. Interesting review on the ink. Need to obtain a sample to try out. The gold shimmer sounds lovely! just what i was thinking!! Brown is one of those colors that I either love or can’t read. I would love to try this brown. don’t have a favorite ink yet, but I’m working on it! I haven’t tried any Organics Studios ink yet. I’d love to try this one! My favorite inks are typically blue, but I’ve never used a brown ink before, especially one that sheens. This one looks lovely. Thanks for holding the giveaway. Brown with shimmer. Hmmm. I intrigued. I usually dont go for these colors, but I always feel like the shimmer is a good touch! I have Nitrogen and samples of Thoreau and Emerson, but haven’t seen a brown yet! I’d love to try one! This looks like a nice ink. I’d like to give it a try. It looks really interesting. Would love to try it out. May have to try a sample of this with my next order. I love writing with brown ink. Black and blue are so pedestrian. The gold shimmer just adds to the delight! I don’t have any brown ink except for walnut ink which I use just by dipping. As always, I would like you to review some of the old standby inks like Waterman, Parker and Sheaffer. Thanks. Amazing artwork on the box and a beautiful color. Thank you for the giveaway. Thanks for the giveaway! I would like to see a review of some fountain pen friendly iron gall inks next! Good looking ink. Would like to see reviews of other brown inks. I’d love to see reviews of more shimmering inks. I’d love to see color comparisons in all color groups starting with purple, of course. I love brown ink! I would love to give this ink a shot! Excited to try this great brown color ink with gold sheen. Brown shimmer? I’m definitely curious to try it out. I really want to see that gold shimmer in person, it sounds very nice. This Ink really sounds incrediable, I already use Organics Studio, and would love to add this one to my collection! Very strange brown. I can’t decide if I like it or not. That said, I can see it being interesting for drawing trees, twigs, and maybe dirt if it’s watered down. I feel like the gold effect would look much better with a moody green or purple. Perhaps you have some shimmering inks in those colors you can review? I’ve tried each of the Organics Studio Amino Acids inks in sample form, and this one was a surprise favorite – I typically don’t lean towards brown colors when it comes to everyday inks, but the gold shimmer adds a neat, new dimension to this. this would be the first shimmer ink I will have ever tried.